I recently ran into a guy coming out of church who asked me, "Do you work at AIIM?" Now, I would like to think that all of us working in the trenches as content management evangelists are famous, but truth be told, we are all a bit more of a niche than we would like to admit. So my surprised response was, "Yes, how do you know AIIM?" He said, "I used to work at NMA [National Micrographics Association, the predecessor of AIIM] back in the late 70s." My response, "Wow, that's great. What were you working on?" He responded, "I was hired to set up a conference on the Paperless Office." Sigh. Well, well, well. Some things don't change. And for those who missed it, we also released our annual state of the industry Paper Wars market research study. The free executive summary is available HERE. Only 17% work in what could be described as a paper-free office. 31% admit their office is piled high with paper documents and paper processes. 40% still use paper for filing “important stuff”, and 56% are wed to signatures on paper for contracts and order forms. 20% report that their consumption of paper is increasing. The number of organizations actively looking at every process for paper elimination has grown from 9% in 2014 to 16% in 2015. Lack of management leadership and individual preferences are the top two reasons why there is still so much paper around. 39% feel there is a general lack of understanding of paper-free options. 40% of organizations report that more than half of their invoices are now delivered electronically - but 35% say that most get printed anyway. 40% of organizations deal with multi-channel content in an ad hoc way. In 40% of organizations, line of business heads and departmental managers are responsible for “radical process review” compared to 14% who point the finger at the head of IT. 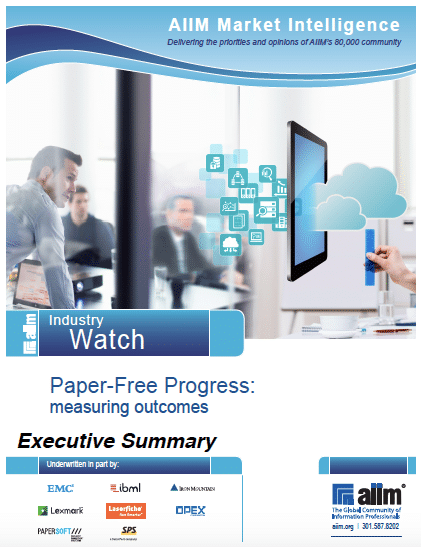 59% of organizations achieved a payback in less than 12 months from their paper-free projects, including 26% in 6 months or less. 84% achieved payback in less than 18 months.